I have been inspired by my Michael Kors Sloan Quilt Stud Clutch, similar one here, to create my Quilted Nails. The supplies needed are: Black nail polish- I used China Glaze Liquid Leather, White nail polish- Wet n Wild, Matte top coat- Essie Matte About You, a Floss Pick, and Hexagon shaped glitters here. 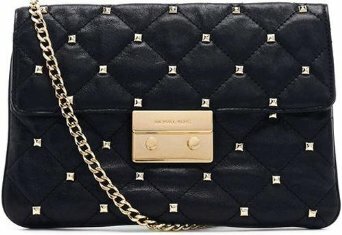 My inspiration is the Michael Kors Sloan Quilt Stud Clutch, similar one here. I love using fashion to inspire my nail art design. The picture below is not mine.